STAY FIT MINUTE: Is Foam Rolling Really a Good Idea? There seems to be strong trend developing in the personal training / strength and conditioning industry involving the use of foam rollers to perform soft tissue work. This appears to be another fad which was borrowed from physical therapists, similar to when “wobble board” training became all the rage. I look at this as an example of a useful tool being taken out of context and significantly overused, to the detriment of this profession, in my opinion. Great trainers and coaches (even some of the best) have become foam rolling fanatics, prothesizing the many benefits of raking various muscles over these rigid cylinders. In no way does this detract from their expertise or credibility, but I do think it is time to take a more critical look at the growing “religion” of foam-rollers. The proponents of foam-rolling often describe it as a form of “self-myofascial release” (SMR). No, despite how that sounds it’s not something naughty you do in front of your computer late at night! OK, so what the heck is myofascial release? SMR is a technique intended to treat “myofascial restrictions” and restore soft-tissue extensibility. It is frequently misunderstood and often described in terms of pressure affecting the Golgi Tendon Organ which causes the muscle to relax via autogenic inhibition. Some argue that this technique relaxes and lengthens not only the muscle, but also stretches the fascia surrounding it, thereby improving “tissue quality” and achieving greater range of motion. Sounds good, right? What is more likely happening during myofascial release is an increase in movement of one layer of fascia over another, or even movement of fascia sliding over muscle. It is unlikely that this will actually “relax” or stretch fascial tissue, considering the tensile strength of fascia. But it does cause your muscles to become looser. However, this is not necessarily a good thing. Foam rolling can be compared to deep tissue massage or static “passive” stretching, which can reduce innervation of the affected muscle groups, thus inhibiting their ability to contract. Essentially, this will leave the muscles temporarily weaker and with less tone... not what I would call “better tissue quality”. This may lead to a greater passive range of motion at the affected joints, but at the expense of active joint stability. You have just put your muscles to sleep and created slack in your joints, which is NOT a good thing before training! 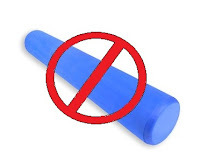 Even if one was to argue for the long term benefits of greater flexibility achieved by this method, a study from the UW-L Journal of Undergraduate Research indicated that no increased range of motion was associated with the use of foam rollers. Most professionals in the fitness and performance industry already understand the negative effects of static stretching before exercise (refer to my article on stretching), but for some reason the connection hasn’t been made with foam rolling. So if you are beginning your training sessions with a dynamic warm up, isometric muscle activation exercises, and active mobility drills, which I would argue is a great idea, but then you proceed to employ the foam roller you are essentially getting your muscles “fired up” and then subsequently “shutting them down” right before the workout! I once heard a well known trainer use the analogy of a an off-balance bicycle wheel, arguing that if one spoke is too loose, you must loosen up all of the spokes to bring it back into balance. Does that make sense? As I understand it, to maintain stability and structural integrity of the wheel, you need to tighten the loose spoke and ensure a certain level of balanced tension between all of them. It is a common approach in this industry, to address muscle tension and pain by attempting to aggressively “loosen up” all of the associated ‘tight’ muscles, when in fact the more sensible approach is to assess and strengthen your weak links. As much as you dislike it, that tension is usually there for a reason; it is a form of protection to create stability where there is a muscular imbalance. If you simply stretch or “roll” away the tight muscles before addressing the related weakness and correcting the imbalance, you have just created more instability. For example, if your shoulders and chest muscles are sore and tight, rather than stretching them, focus on activating and strengthening your mid-back. Once you have restored a healthy muscle tone and strength to the scapular stabilizers, your posture will be improved and the compensatory pectoral tension will be relieved. It’s a matter of addressing the root of the problem (which is typically weakness and instability, ie: the “loose spokes”) rather than the symptoms (ie: the residual tightness in other muscles due to compensation for that weakness). You may not get the instant gratification attained by foam rolling, but you will be building greater structural integrity and developing a long term solution. I am a strong advocate of a technique called Muscle Activation Technique (MAT), founded by Greg Roskopf. There is plenty of great information on this technique on the website www.muscleactivation.com, explaining the importance of addressing muscle weakness rather than muscle tightness. Check it out. I understand that my opinion on this subject is not a popular one, but despite the fact that it may not benefit me to share this information, I do believe it will benefit you, the reader. So the next time you are considering raking yourself over your Extra-Rigid High Density Foam Roller to tenderize your IT bands, I’m suggesting you think again. Do your research and consider what your goals actually are. Do you want to achieve muscle looseness and passive range of motion at the expense of stability, or are you looking for muscle strength and stability with a healthy active range of motion? I’m not saying that the foam roller has no practical applications. I am simply implying that it is over-used and inappropriately applied. If you are still convinced of its effectiveness, at the very least I strongly recommend that you refrain from using it before training and aim to be more specific and a little less “aggressive” with your rolling. I hope I’ve given you something to think about and provided an alternative viewpoint on foam rolling. If you have questions or want more information on the subject, please feel free to contact me. very provocative post Josh. I've always applied foam rolling as a recovery tool rather than a workout prep tool with respect to my own training. Does your experience and research support its use in that manner? Yes, depending on how you use it, as a post-workout recovery tool it definitely makes more sense... this can promote relaxation of the muscles, as well as circulation. I'm just not sure I would apply it globally (ie: roll out the whole body). My opinion with foam rolling is similar to my view of passive stretching or deep tissue massage. I have never been a big fan of "fancy gadgets" and "new breakout techniques" from TV commercials. I've been working out for 20 years, and I have never used foam roller. Great post! I recently started a new training program where foam folling was used in the warm-up prior to training. After starting this I have had several injuries - rotated tailbone, sacrum moved out of place - and I think they are due to the foam rolling before training and the loosening of the muscles that occured from it. I have stopped using it before training and am using it as a recovery tool now. Very informative read, an article that all athletes/trainers should read. I found the article to be revealing in a sense, where i started foam rolling and it has created some issues in my own area of training. These issues were minor tears located in the hamstring area while dead-lifting. I never had any serious injuries or minor ones as of a matter of fact. As soon as i started foam rolling the hamstring area, these problems started to occur and i felt as though i had less stability while lifting. So, in conclusion i will most likely cut back on foam rolling for while analyzing future outcomes. I found it fascinating that people tend to freely follow something so quickly without further research. Thanks for the article that is very informative and that has alerted me.